Reduced mass equals increased acceleration. A lightweight flywheel works particulary well with turbo-charged engine because it reduces the typical turbo "lag". 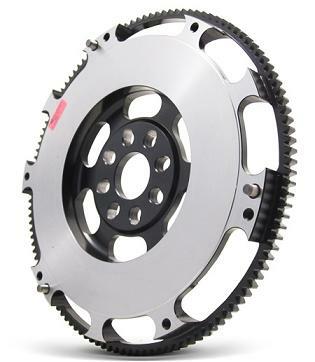 The installation of a Clutch Masters flywheel should be strongly considered when changing to a performance clutch system. Clutch Master Flywheels are available in either Steel or Aluminum. Maximum Strength Chromoly Flywheels, the one piece unit is designed to handle extreme abuse. SFI Certified. Clutch Masters 2 piece billet aluminum flywheels are made from the highest quality 6061 - T6 or better grade aluminum. This material is chosen for its properties that are much more suitable for the environment with regards to heat dissipation and serviceability. The replaceable friction surface we use is incredibly tough high carbon steel. 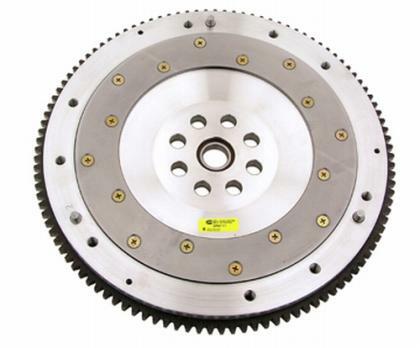 This allows mating with any type of clutch friction material without any worry. The starter ring gears are made of high carbon heat-treated steel for long lasting durability. We button the unit together with military grade fasteners for what we feel is the premier piece in the industry today. Click the button below to add the Integra Flywheel to your wish list.